Your toddler will love to color, play or study using the DISNEY CHAIR DESK WITH STORAGE BIN. 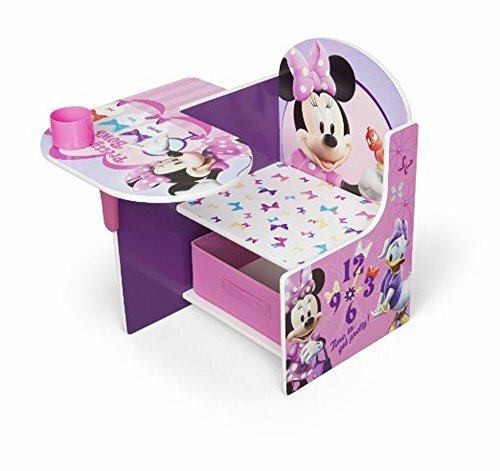 This kids' desk and chair set are adorned with images of Minnie Mouse, and it also has an image of Daisy Duck on the side. With a flat surface to work on, this Minnie Mouse table and the chair are an ideal workspace for doing homework, reading, or drawing. This Disney Desk and Chair comes with a storage bin that fits under the seat. This storage bin in the kids' desk and chair set can hold all of the storage supplies that your child needs on a regular basis while keeping supplies organized in a neat manner. Easy to access, the bin slides in and out from under the seat. Stationary items such as pens, pencils, and crayons fit in the included cup holder. -Disney Desk and Chair for toddlers measures 23.5" long x 20.5" wide x 21.5" high.